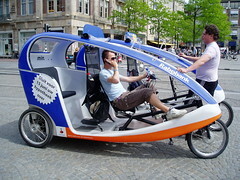 An European version of the cycle rickshaw in Amsterdam. I sighted many rickshaws in the touristy part of the city called platz. I was in Vegas last year and saw some rickshaws, but they weren't high-tech.! The slide show in Flickr is really good. I remember our cycle-rickshaw guys in Madras, with the kerosene Motor.! and the pRRRRRRRRRRRRRR sound.! Even if it comes to india the metering instrument shouldnt be the present one. Umm I never thought about that.! cool.we saw the cycles in amsterdam.we did not see any in belgium. Yes, It was in Amsterdam.. not in Belgium.. my mistake.. sorry..